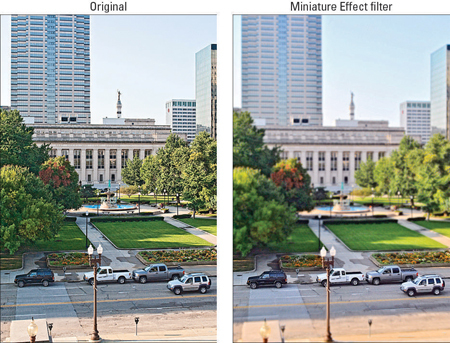 The Miniature Effect filter on the Retouch menu of your Nikon D3200 attempts to create a photographic equivalent of architectural small-scale models by applying a strong blur to all but one portion of a landscape, as shown in the following figure. The left photo is the original; the right shows the result of applying the filter. In this example, the focus point is set on the part of the street occupied by the cars. The Miniature Effect throws all but a small portion of a scene into very soft focus. Display your photo in full-frame playback and press OK to bring up the Retouch menu. Highlight Miniature Effect, as shown on the left in the following figure, and press OK.
Use the Multi Selector to position the yellow rectangle over the area you want to keep in sharp focus. You see your image in a preview similar to the one shown on the right in the figure. Use the Multi Selector to position the yellow box over the area you want to keep in sharp focus. Resize the box: Press the Multi Selector up to enlarge the box; press down to shrink it. Move the box: Press the Multi Selector right or left. To preview the effect, press the Zoom In button. When you release the button, you’re returned to the screen shown on the right in preceding figure. Keep adjusting the placement of the box and previewing the result until you’re happy. To create a copy of your photo with the effect applied, press OK.